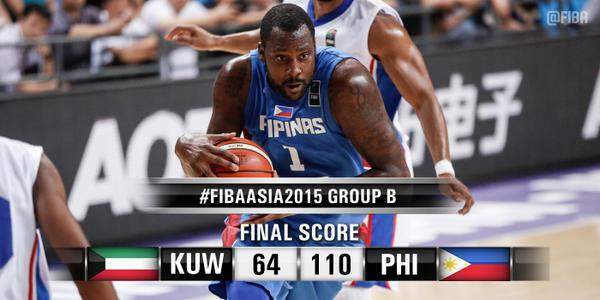 Video Highlights: Gilas Pilipinas dominates Kuwait, 110-64 | #FIBAAsia2015 - Balita Boss! Watch the highlights of Kuwait v Philippines on day 3 at the 2015 FIBA Asia Championship (25. September 2015). The Philippines cruised past Kuwait, 110-64, on Friday at the 2015 FIBA Asia Championship in Changsha, China. Terrence Romeo led the Philippine national men’s basketball team with 19 points, Jason Castro finished with 16, while Calvin Abueva and JC Intal had 10 each. Abdulrahman Alshammari scored 15 for Kuwait, Abdullah Alsaeid had 13 points and Mashari Abu Dhom chipped in with 12 for Kuwait. The Gilas Pilipinas finished second in Group B behind Palestine with a 2-1 record and will face Japan to start its second round schedule on Sunday at 4:45 p.m.